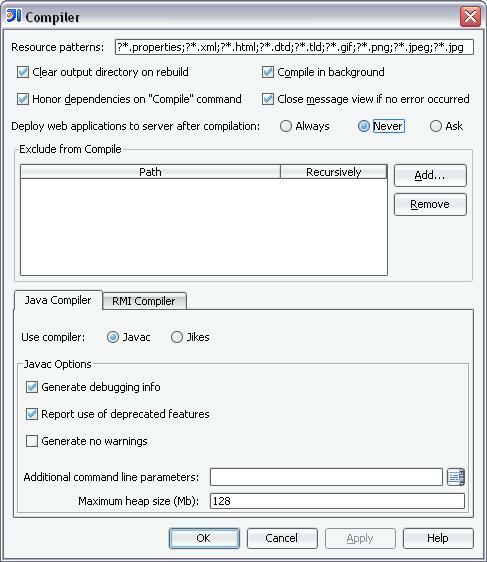 In compiler settings, I have "Deploy web applications to server after compilation" set to "None". However, each time I compile a java class, my entire web app is copied over to its exploded directory. I have "synchronize exploded directory" unchecked in Module Settings. Anyone know how to fix this? Thanks for the screenshot. I have the exact same settings, as I mentioned in my original email. I am assuming that IDEA doesn't behave like this for you and that it does honor the compiler settings. Are you on 3516? 3516 also. What about the honor dependencies on the compiler tab? I have it checked as well.